After a wonderful day and a half spent in Sevilla, next up was our three-hour coach journey to Granada for the second half of our trip. As I mentioned in the last post, we had managed to get tickets on a Premium Alsa Bus, which included a lunch box, leather reclining seats and wifi – such luxury after some very uncomfortable overnight coaches (why can’t they all be like this?!). Continuing with the theme of comfort, our first major activity when we arrived on the Friday evening, as you can tell by this blog title, was to go to the Hammam Al Ándalus baths. My visit to the Hammam is without a doubt one of my top ten life experiences in my head right now – yes, it was that good! I wish I could go back already, and that they expand further to other cities in Spain (*cough* Salamanca, and maybe to the UK too! We need some southern comfort up north too, y’know). I met up with my friend Floorke on the Saturday, a coursemate studying in Granada this semester who I also visited in Provence last October! She admitted that she still hadn’t gone to the baths (much to my horror), but since my visit, she has booked to go to the Hammam soon, so all is okay. I bet that if I lived there, I would be there at least once a month. On the way from our hotel, which was more or less a 5 minute walk to the Hammam, we walked over a little bridge with a stream. 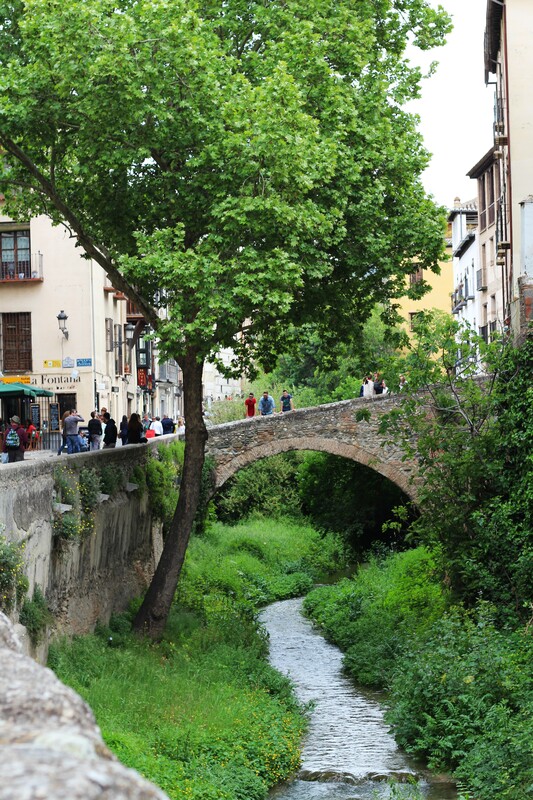 It was possibly my favourite spot in Granada – it felt so quaint and cosy. If you ever find yourself in one of the cities where the Hammams are located (Granada, Córdoba, Málaga, Madrid), if you are looking for some time out and relaxation, this is the place to be! I’m considering a little trip to Madrid in June just for this (okay, and maybe a visit to the cat café…). It is 25€ with a student card, but you should reserve in advance (email or phone). There are also other tariffs for non-students. The entry allows you to have a session in the baths for 90 minutes with a 15 minute massage included! There are several slots available during the day to go to the baths and we opted for the 10pm slot. It’s fair enough to say I slept really well afterwards! It was just what I needed. When you arrive, before you enter the changing rooms you are offered some Morrocan Mint Tea and it is divine. It is also available in a certain room inside the baths which, of course, I took full advantage of. When I went shopping the following morning, I made sure that I bought a packet to take home with me. I have yet to taste it but fingers crossed it lives up to my expectations. The baths are extremely clean. You are provided with blue plastic shoe covers when you enter in order to keep the changing areas spotless. The lockers were even alluminated as the room has low lighting, so you ould see where your things were, the lockers are then locked by your choice of passcode. All you need to bring with you is a swimsuit/bikini as they provide towels for you. During the bathing experience, there were attendants available if you had any questions, needed help, and they were always relighting candles and making sure people were not talking too loudly. When we first went in, one attendant showed us each area of the baths before we were allowed to explore. The Hammam has a variety of hot, warm and cold pools, a hammam steam room which smelled like mint, trickling fountains and everywhere is lit by candlelight. It felt like true luxury. I was given my massage at the beginning, which was a great way to relax and get in the mood of the hammam. You have the choice of several scents – I chose red amber which I liked, but of course as I went in the pools afterwards, the scent did not stay. When the hour and a half is over, an attendant rings a bell to let you know it’s time to leave the hammam and return to reality. The hammam is a truely special space because it allows you to completely let go of the outside world, your stresses and troubles for a little while. I’m so glad I went during my time in Granada, and I would go back in a heartbeat. I would recommend anyone to go if you enjoy time out in a beautiful place. It was the perfect remedy to relax after many hours traveling by coach and I felt refreshed for my next full day exploring Granada and The Alhambra. Would you squeeze in a visit to the Hammam Al Ándalus into your itinerary for Andalucía?